Need a relaxing escape from your everyday routine? 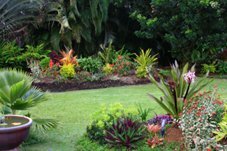 Tropical landscape design will create a tropical getaway right outside your door. By applying basic landscaping design concepts using tropical plants and flowers, your landscape will be transformed into a paradise at home. Elements of Art - Color, line, form, texture, and scale are used in conjunction with design principles throughout the planning process. Principles of Design - Attention to unity, balance, transition, proportion, pattern, and emphasis will ensure a tropical landscape design that exceeds your expectations. Developing a Design - An organized approach streamlines the planning process and improves efficiency. The sound of a rippling brook or flowing waterfall encourages feelings of peace and tranquility. Include a water feature in your tropical landscape design to create a peaceful and soothing ambiance. Cascading Waterfall – A beautiful addition to the design of a pond, or added as a complement to your swimming pool. Water Garden – Imagine the sight and sound of water trickling between aquatic plantings of plantings of delphinium, lupine and hollyhocks. Enjoy watching the wildlife that frequents the pond like the frogs and hummingbirds. Pond – Can act as a collection point for a waterfall, or be a home to Koi or goldfish. Rippling Brook – Enjoy the tranquility and natural sounds of a stream in your tropical escape. Fountain – Flowing water adds delightful sound and a peaceful ambiance. Consider adding a fountain to your landscape as a design focal point. Enhance the appearance of the yard to create balance and fluid design. Create boundaries for privacy for privacy and safety. Correct landscape problem areas. Retaining walls correct steep slopes as well as prevent soil erosion. 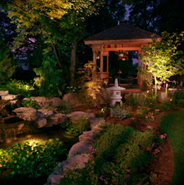 Outdoor spaces are inviting, secure, and attractive at night with proper landscape lighting design. Landscape lighting can be used to illuminate walkways and patios, spotlight a sculpture or fountain, or highlight plant-life in a tropical landscape. Safety – Prevents tripping and falling on steps, pathways, patios, and decks. Security – Discourage unwanted guests from your property. Utility – Enjoy your outdoor tropical paradise or entertain guests after the sun sets. Beauty - Strategically placed lighting reveals the beauty of you outdoor tropical landscape. Landscape Design Professional: Do you need one? A functional, creative, and beautiful landscape requires knowledge of design principles, plant life, and structural concepts. Depending on the scope of your project, your tropical landscape plan might require extensive knowledge of irrigation systems, tropical plant-life, outdoor lighting, and hardscaping. Have specialized knowledge of tropical plant-life. Possess an understanding of basic design principles. Be aware of any city regulations and rules that must be followed. Work with you throughout the project to ensure your vision comes to life.